Message: I have been dyeing for many years. I have had no reaction to soda ash up until about 2 months ago. About that time, I got a huge rash/blisters on my hand that I thought were caused by poison ivy/oak. Now, whenever I touch fabric that has soaked in soda ash, I get pimple-like things on my hands and forearms. I am sure they are caused by overexposure to the soda ash. They are quite irritating. Do you think my soda ash soak is too “hot”? I have been using 100% sodium carbonate that I buy in ph Up in the pool supply store. Do you think that it would be less irritating if I were to use light soda ash as supplied by ProChem? I know that you can use soda ash directly in the dyes but it gives you a shorter life for the dyes. I am not sure about that process. I generally dye about 100 shirts a week, over a 5 day period. I have been dying with procion dyes for 25 years and never encountered this problem before. The weird part is that most of the skin irritation occurs on my left hand while my right hand is relatively free from any irritation. Have you been soaking your fabric in soda ash before tying it? If so, the answer is to stop doing that. Moisten your fabric with plain water (a spray bottle is nice for this unless you prefer to soak it) and tie it. Plain water works just as well as water for the tying step, for those who prefer to tie wet fabric, and then, after tying, it can be displaced by the soda ash presoak. After you have tied your fabric, put on heavy duty rubber gloves to place it into your soda ash soak. Use a relatively strong soda ash presoak mixture, one cup per gallon, rather than the nine tablespoons per gallon in the ProChem recipe, to make up for the extra water (though soda ash works well over a surprisingly wide range of concentrations). Get a mop bucket with a wringer to squeeze out the extra soda ash solution after soaking, so you don’t have to handle it so much by squeezing out extra soda ash solution by hand. The spin cycle of some washing machines works well for this step, but other washing machines spray on extra water during spinning, which is no good at all. Wear reliable gloves whenever you’re near soda ash, including your freshly dyed items before rinsing out. If you are line-drying the soda ash into the fabric before dyeing, after the presoak but before tying, the fabric is probably too irritating for you to handle at all. The dry soda ash tends to get into the air during the tying step. Adding soda ash directly to the dye works well if you will be using the dye right away, but as you note the dye goes bad only an hour or so after adding the soda ash to it. There’s a good recipe for this technique on my dye thickener page. To protect your hands while dyeing, try latex-free gloves to see whether a latex allergy might be contributing to your problem; you can choose vinyl or nitrile gloves, instead. There are some nice elbow-length nitrile gloves available for dyeing. Look for the type with a cotton lining, as well as the thinner unlined type for when you need more sensitivity. Depending on your source of clothing blanks, it’s possible for them to be contaminated with formaldehyde and other chemicals when you receive them. 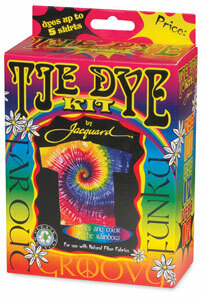 (This is less likely with clothing that is marked “prepared for dyeing”.) Wear gloves to handle them as you place them in the washing machine for pre-scouring. Light soda ash will not make any difference. It’s the exact same chemical, just a little bit fluffier maybe. It doesn’t matter whether you order soda ash from a dye supplier, or purchase soda ash as a pH increaser for swimming pools; the latter is often more convenient. There are other chemicals that can be substituted for soda ash, such as trisodium phosphate (TSP), but it seems likely that your problem may be due to irritation from the high pH of the soda ash, rather than due to a specific allergy to soda ash. If this is the cause, then switching chemicals will not help at all, because all of the chemicals that can be substituted for soda ash, for dyeing with fiber reactive dye, produce a similar high pH. It’s the high pH that activates the cellulose molecule so that it can attack the dye molecule. Trisodium phosphate produces a higher pH than soda ash, so it is even more irritating. All of these high-pH chemicals tend to react with the natural oils in your skin, producing soap. That’s why your skin feels so slippery after you get soda ash on it. What you feel is the newly created soap. It is extremely irritating to the skin to lose the protective oils. In addition to strictly avoiding all exposure of your skin to soda ash, you will need to replenish the oils. Avoid exposure to very hot water. You will probably want to apply lots of moisturizer to your hands frequently throughout the day, especially after every time you have gotten them wet, and before going to bed at night. Be aware of anything that might be causing an allergic reaction; if you are concerned about an ingredient in your skin moisturizer, you can apply plain vegetable shortening, such as Crisco, to your hands. It is distressingly greasy, but very suitable for extremely sensitive skin; some eczema sufferers like to put it on at bedtime and wear thin cotton gloves. If your problem continues after you have stopped exposing your skin to soda ash, you should see a dermatologist. For more information about soda ash and its role in dyeing, see my FAQ page What is soda ash, and what’s it for in dyeing? This entry was posted in soda ash on July 24, 2015 by pburch.